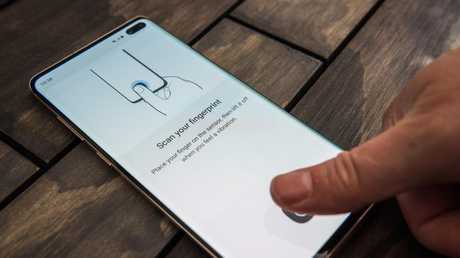 One smartphone that folds in two, another that delivers next-generation internet speeds, and three handsets with up to five cameras each and invisible fingerprint scanners were unveiled this morning, with promises they would "change the smartphone as we know it". The world's biggest smartphone maker, Samsung, unveiled the devices in San Francisco, stealing the spotlight from the upcoming Mobile World Congress in Barcelona and taking over a venue best known for events from its biggest rival, Apple. But analysts warned many of Samsung's groundbreaking phones would also come with record-breaking prices when they arrived in Australia from March, and not all buyers would be willing to invest in flexible smartphones before they proved themselves. Samsung revealed its much anticipated Galaxy Fold at the Silicon Valley event, showing off a device with a 4.6-inch screen up front that opened up like a book to reveal a 7.3-inch, tablet-style, flexible display inside. The fold-out phone will also feature six cameras - one on the front, two in the middle, and another three on the back - and will support using three apps at once, wirelessly charging other devices on its back cover, and will come with a special edition of Google's Android software to support its two screens. Samsung Electronics Australia IT and mobile head Garry McGregor said the device had been "six-plus years in the making," was "in a category all of its own," and would change the way Australians used smartphones when it arrived in the first half of the year. "The form factor of the smartphone has been fairly static for the last 10 years," he said. 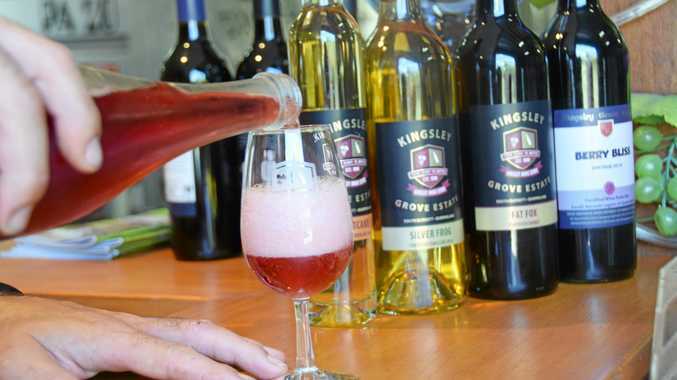 "What we're demonstrating here is over the next 10 years its form could change as we know it. People want something that is comfortable in their pocket but also gives them the chance to really consume data and create content in a way they've never been able to before." The Galaxy Fold, which uses a sophisticated hinge with interlocking gears that click into place, will be thicker than a standard phone at 1.7cm, but still small enough to sit inside a pocket. Samsung has yet to reveal a price for its headline smartphone. The company also launched four other phones at the event, however, including two models that will break price records to become the most expensive smartphones in Australia. 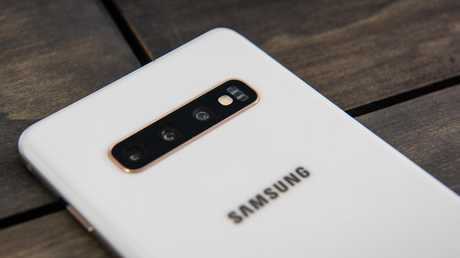 The Samsung Galaxy S10 5G will be among the first handsets to support next-generation phone networks with download speeds up to 20 times faster than 4G, and will also come with four cameras on the rear of the phone and two on the front. 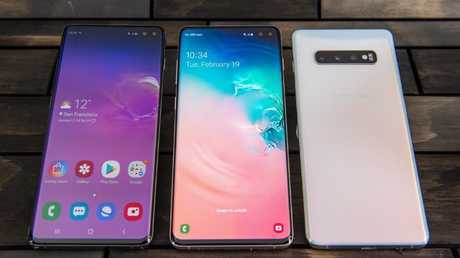 The company did not issue a price for the 5G phone, but it will cost more than the $2399 top model Galaxy S10+ handset that also sports an Infinity-O screen with narrow borders, and an Ultrasonic fingerprint scanner built into the screen that uses sound waves. The phone also comes with five cameras, up to a terabyte of storage, and a scratch-resistant, ceramic finish. The Galaxy S10, with four cameras, will cost less at $1699, and the S10e, with three cameras and a smaller 5.8-inch screen, will match last year's launch price at $1199. Samsung's Galaxy S10+, S10, and S10e will be available for pre-order at 9am today, with a launch date of March 8. Despite the high-profile smartphone launch, Samsung is expected to face stiff competition from Chinese competitors Huawei and Xiaomi, which are tipped to launch flexible phones next week. Telsyte managing director Foad Fadaghi said major smartphone makers were taking big gambles this year to convince buyers to upgrade their handsets. "The marketplace is so competitive that manufacturers are looking for any way to differentiate their product," he said. "It will come down to how these products are executed and marketed. They could have a significant mountain to climb to convince people these (flexible phones) are the way of the future." Forrester principal analyst Thomas Husson predicted it could take "longer for those foldable screens to reinvent the smartphone category" than makers expected as consumers waited to make sure the technology worked as promised.